Bellator 208 results are underway as the Viacom promotion holds this latest event on television for fight fans around the world to watch the show. It’s once again fight day here at LowKickMMA, and the talent on display tonight (Saturday, October 13, 2018) will come in the form of Bellator 208. Headlining the card are Fedor Emelianenko and Chael Sonnen, but there’s a whole bunch of great fights also taking place on the rest of the main card. Fedor Emelianenko and Chael Sonnen meet in a heavyweight tournament semifinal bout in the main event. In round 1, Fedor drops Sonnen with a huge left hook to the jaw but lets him up. Sonnen is very aggressive, looking for the takedown. Sonnen shoots in again, but Fedor reverses him and lands on top. Fedor stands up. Sonnen shoots in again but Fedor simply tosses him to the canvas and lets him back up. Sonnen is nearly stopped before he rolls over and covers up. Sonnen ties him up and takes Fedor down hard. Sonnen’s takedown is stuffed. Fedor is on top and raining down punches. 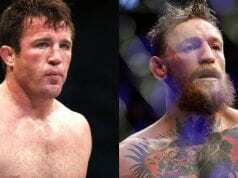 Chael can’t escape and the fight is over. Benson Henderson and Saad Awad meet in a lightweight bout in the co-main event. In round 1, Henderson slams a left kick into Awad’s ribs to start the fracas. Awad is coming forward; Henderson is backing away to create space. Henderson shoots in and scores a nice takedown. Awad went for a d’arce choke from his back but Henderson fought out by landing a series of strikes. In round 2, Henderson shoots in for a takedown but Awad reverses him and lands on top. Henderson scrambles and then presses Awad into the cage. enderson takes Awad’s back but he is too high and slips off. Awad can’t capitalize and Henderson takes him down against the cage again. Henderson goes for the arm-triangle but time runs out. In round 3, Henderson shoots. Awad sprawls and lands a knee that looked illegal. Awad gets taken down again. This is just a clinic. They were stood up after Henderson grabbed the cage in top position. Henderson landes a takedown to end the round and fight. Bendo got the decision win. Cheick Kongo vs. Timothy Johnson is next in a heavyweight bout. In round 1, Johnson is rocked by a glancing right to the temple and he falls to the canvas before rolling over. Kongo cracks him with a few more punches to wrap it up. Alexander Shlemenko vs. Anatoly Tokov is next in a middleweight bout. In round 1, Tokov goes with the double underhooks and drags Storm to the canvas and lands on top. Storm gets back to his feet but Tokov takes him right back down. It’s a slow-paced round and it’s close. In round 2, After trading punches, Storm accidentally slams his foot right on Tokov’s groin. Tokov is controlling the pace, mostly from within the clinch. In round 3, Shlemenko is gassing out as he backs away. There was some action but nothing meaningful. Nice knee and body kick by Shlemenko. okov changes levels and takes Storm down, but he can’t keep him there. The judges gave the win to Tokov. Opening the main card on the Paramount is Andy Main vs. Henry Corrales in a featherweight bout. In round 1, Main lands a few low kicks and continues to keep a distance behind that jab. In round 2, Corrales pops Main with a two-punch combo upstairs late in the round. In round 3, Massive left hand by Corrales drops Main! Henry pounces on the ground and Rob Hinds calls it off.